We're arriving at Albany, the capital of New York State. I slept well this morning in the coach. I could say I had been sleeping for long time, but not deeply. I cannot read or study even for an hour, because the car jolts like bus. I don't think I can go on writing any more for now. When I went to lounge car to have a lunch, I realized that I was sitting on a bad seat . We don't have any windows because it is very end of the car. That's also why it jolts so frequently. It would be better if I had stood in the line for the train earlier in the Chicago Union Station. I am in the lobby of the Hosteling International New York City. The Hostel here is completely different from Chicago's. Everything looks new and clean. It doesn't smell badly like Chicago's. There is the Harem near here, and outside seems to be somewhat dangerous, though. I might not be able to seek new friends to go to jazz club or something like that together here. After I checked in, I got subway and went to Lincoln Center to see programs of orchestra or ballet. I got a ballet ticket which featured jazz trumpeter, Winton Marsalis. I didn't think that he was going to dance with them! Unfortunately there was no ticket for orchestra. Besides, I thought I was out of luck because the Village Voice says that there is no great jazz program during my staying. Guitarist Kenny Barrell appeared again although I never wanted to see him again. I might go to see the Mingus Big Band. I am in the cafeteria of The Museum Of Modern Art (MOMA). I got up at noon and took Metro. I saw a few music store, but I don`t think they have good sales. Because they have no vibraphones, no marimbas and no xylophones, unlike the music shop I found in Chicago. This is a kind of selfish-thinking, though. I thought here is busy and I did`t feel comfortable in this city. One of the reason is that there is a lot of people like Tokyo. Chicago was like Sapporo or Sendai, northern cities in Japan. Everything was clean and new. Now I think that there might be ways to feel conformable in this city, I don`t know exactly how. But they must be the same way as in Tokyo. The MOMA is smaller scale than Art Institute of Chicago, perhaps than The Metropolitan Museum of Art. There are works of Henri Matisse, Joan Miro, Fernard Leger, Jackson Pollok, Gustav Klimt, Arberto Giacometti, Serrat, Jasper Jones, Kandinsky, etc. At New York State Theater, I watched the New York City Ballet. Today, we had a special program, "Annual Spring Gala". Everyone dressed up except for a few people including me. I saw a young couple who were seemed to be actors or some important people, and flashed by some journalists` cameras. I don`t know them and heard some people were saying, "Who are they? ""I don`t know!" The program began. It was the first time to watch ballet as a live performance, so I felt everything was great, except for the orchestra. The third program was performed on saxophone quartet. That sounded nice to me. In the intermission, jazz trumpeter, Wynton Marsalis` band was playing a blues like a jam session. The band played for final program "Jazz" directed by Winton Marsalis. The performance was nice, but I could not always understand what he was thinking in the process of creating that. It was completely written music which has old style, like rag-time and Dixieland. I don`t think the music was effective for the ballet. It was interesting that the behavior of Jazz men was a kind of cool contrasted with elegant dancers. I am in "Au Bon Pain" by the Empire State Building. Before I went out of the Hostel, I talked with a man who came from California . He is on a trip and came from California by hitch-hike. It is incredible that it took almost for a month from California to here. Finally he said, "Have a safe trip!!" That was a nice word. There must be many Japanese tourist in this Hostel, but I didn`t use Japanese yet, except for calling to my apartment last night. I am in a coffee shop in the United Nations. 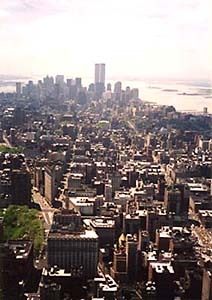 Before I came here, I visited the Empire State Building. Unfortunately it took about an hour to get the observatory. But it is very clear today. So I saw everything around the building. There were crowds though. 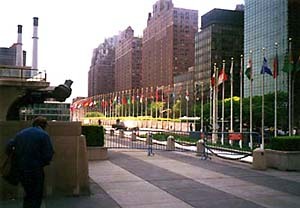 Then I walked to the United Nations and joined a guided tour which had fifteen people group with a guide. It was very nice to have an opportunity to learn how the UN works. And I wrote a postcard which is special and good only in this building. Because here is an international territory, not USA. I am exhaust because I could not find the jazz club, "Sweet Basil", where I wanted to listen to Rene quintet. I did not know that there are addresses numbering to the south on seventh avenue. Finally I gave up finding them and had a Chinese food. I was out of luck today. After visiting the UN, I went to Kinokuniya Japanese book store. Luckily I got an Japanese news paper at free. Then I was in Julliard Bookstore. There are many music books and music sheets. I got musics of Bartok`s String Quartet, etc. which I could not get in Boston. Tonight I talked with a Japanese guy. He said that Japanese tend to pack more compactly than other countries` tourists like US. They usually pack almost everything they like. It is an interesting point.